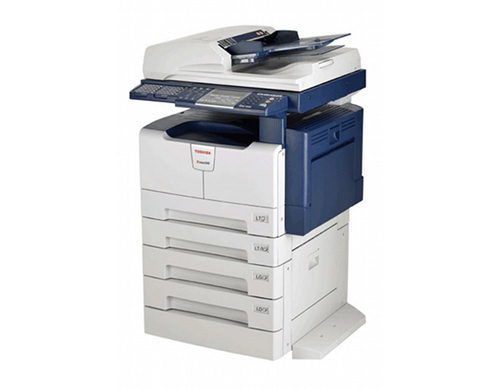 The Toshiba e-Studio 181 is a 3-in-1 multifunction copier that’s able to produce 11” x 17” ledger size B&W prints and copies at speeds up to 18 pages per minute, and 600 x 600 dpi color scans. Designed for small and medium businesses, the e-Studio 181 has additional options that allow it to grow to meet a business’ needs. While other multi-functions only support legal size paper, the Toshiba e-Studio 181 starts out with an oversized 11” x 17” platen for scanning. At 71 pounds, this 3-in-1 e-Studio has a footprint 23.6” x 25.3” to accommodate handling ledger and tabloid size paper. The copier is a little large to put on a desk but will feel right at home on any credenza. The e-Studio 181 comes stock with a cassette tray that can hold 250-sheets of 11” x 17” ledger paper, of bond weights from 17 to 20 pounds. Transparencies, labels, and heavier paper weights up to 90 pounds are handled through the 100-sheet multi-purpose bypass tray. A second 250-sheet cassette can be attached to double the paper capacity. While printing & copying is in monochrome, the 181 scans in color to a resolution of only 600 dpi and supports TWAIN scanning. Scan formats are BMP and TIFF. TIFF is useful in saving multiple pages on a single file instead of a file for every page. Memory won’t be an issue with the e-Studio 181. Starting out with 32MB memory, memory can be increased up to 96MB. By using the high-speed USB connection to make the e-Studio a shared printer, multiple print jobs won’t be a problem. The control panels for the e-Studios are pretty straightforward, so you don’t need to go to the manual to figure things out. In addition to magnification, quantity, and exposure, you can control which paper tray to use and to switch to the toner save mode. A full alphanumeric display makes it easy to do troubleshooting and when to start ordering supplies. To print with the e-Studio 181 requires connecting a computer directly to its USB 2.0 interface. For other computers to print requires either setting the computer’s OS to share the printer, or connecting the e-Studio to an external print server device. If network printing is a must and you want to make it as painless as possible, you might want to get either an e-Studio 182 or 242 with the GA1191 network print option. It would have been nice if the Automatic Document Feeder (ADF)--which Toshiba prominently displays on all its 181 advertising—was standard and not an option you had to purchase. 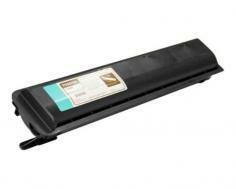 Even a small office can benefit having an auto-feeder for copying and scanning multiple pages. Unless the buyer reads the fine print, it would be quite easy to buy this e-Studio thinking you were also buying the ADF and the second paper cassette tray. While it’s understandable that the e-Studio is a multifunction office copier, since it has a printer function, Toshiba could have included PCL instead of the generic Windows-based GDI printer interface. However, typical office users aren’t likely to notice any difference in performance or print quality. Review it: "Toshiba e-Studio 181 "
The e-Studio has separate toner, developer and drum to help reduce overall consumables costs. 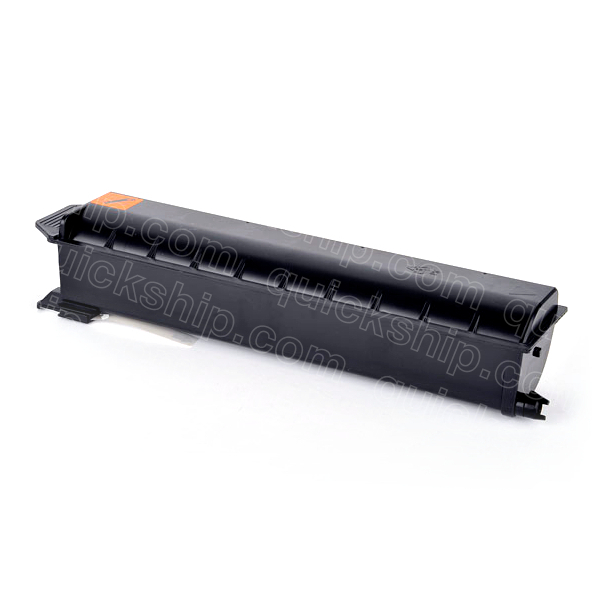 Toshiba offers an impressive print yield of 24,500 pages (at 5% coverage) per toner cartridge, which is easily accessed from a front door panel on the machine. The drum and developer units will need to be replaced ever 77,000 pages (or just about every 3rd toner replacement).